If you need to train 4 or more people we can provide organisation specific and in-house courses at the venue of your choice. Any of our traditional, core courses can be adapted or used in their standard format to provide training within the workplace. This can be very cost effective and beneficial in building teams as well as helping to unify the level of understanding across company departments and locations. 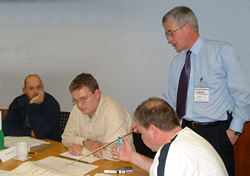 We have a long history of working with organisations to develop courses on specialist topics, this may be in support of a one-off project implementation or perhaps, to raise the general level of operational, technical and product knowledge. Please contact Roger Gutteridge to discuss reduced rates for your in-house courses.